For it is, primarily that (a place of refuge), and not just for me. In the last week, a slightly emaciated OAP by the name of Bertie has spent every waking moment in my garden; every sleeping one too. OAP, btw, stands for Old Age Pigeon. When I say pigeon, please don’t conflate Bertie with those scavenging, winged-rodent ne’er-do-wells you trip over in Trafalgar Square, fighting over a hamburger bun, fouling foul statues. Rather, Bertie, like me, is a child of the ‘burbs, who along with his wife Bertha, has ever since I’ve known him done his daily rounds of all the gardens in the HA3 postcode. Each spring B&B build a nest in the 40 foot fir tree in my garden, from where they produce their bairns. So it is now with a mixture of happiness and sadness (sappiness?) that I spot Bertie, sans Bertha, tottering around from one flower bed to the next in this his last week on earth, unwilling, or rather unable to fly, even when approached by a curious puppy. I get a similar sappy when I spy him bedding down for the night behind Choisya Goldfingers with its bright everyellow covering, almost too bright in summer its foliage, but an uplifting display for the grey and raining autumn we’re having at the moment. I would like to think that Bertie had chosen my garden in which to spend his final days and nights partly due to all the wordless, but happy associations stored in his pigeon brain – associations accumulated over a lifetime of visits to this 40 x 15 ft plot of land. Another reason for his choice, even though I am in no way an expert on pigeon psychology, might be due to the fact that at this point in his life, unable to fly, Bertie knows that this is the only garden in the neighbourhood in which he might be relatively safe from ground-roaming predators, especially those in the shape of cats and foxes. He ‘knows’ this not because not because my garden has a “Cats/Foxes Out!” sign posted outside (which he wouldn’t be able to read anyway, nor would the intruders), nor because small ferrets are to be found patrolling the property, one in every corner of the garden, dressed menacingly in black jackets, gold chains, and wearing dark glasses no matter the light levels. No, it’s got nothing to do with these signifiers of safety. Rather, Bertie knows he’s safe in the garden because of electricity. Electricity which courses through black polytwine, strung just above the brown panel fencing, and threaded through with stainless steel providing a voltage strong enough to deliver a prickly tingle. This wasn’t put up with the intention of turning the garden into a care home for enfeebled birdies but rather to stop bone-burying and litter-fouling animals from using my newly sewn seed beds as sandpits and toilets. Extreme measures you might say, to turn one’s backyard into the Gaza strip just because the wildlife refuses to play civilised ball with you planting plans. And maybe even a tad un-British? “Well one just puts up with them [the foxes, the cats], doesn’t one?” a fellow gardener remarks when I tell her my tales of seedling massacres by the foxes. I can see from the expression on her face that she is clearly appalled by the cognitive dissonance of gardens + electric fencing. But now, hanging out with Bertie, I am pleased to have created my electrified refuge. 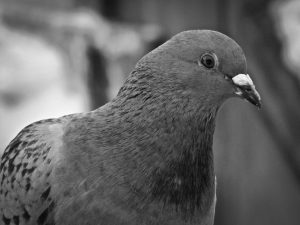 For although we hold sway at the top of the food chain by dint of our cognitive capacities, as mortal creatures, mortal as pigeons really when it comes to the aging, illness, death, we are also as aware as any other species of our vulnerabilities. This means we will spend a great amount of time and resources protecting these vulnerabilities and the vulnerabilities of those we hold dear. This can be physical protection, locks and bolts on doors and windows, but also psychic defences. Psychologists, beginning with Freud, might even argue that most of what we recognise in ourselves as ourselves (how we think, feel and behave), is defensive or protective in nature. You could say that when we think of personality, our own, and the people we know, it is largely marked out by a kind of electrified (neurological) boundary, a psychic skin, wrapped around, or inside our physical one. I would say it still is. For only here, in the garden-as-refuge, can grounded pigeons waddle about contentedly, making multiple trips to the all-you-can-eat buffet stocked with sunflower seeds, suet balls, peanuts – all set at a height the flightless birdies can reach, protected from the rain by a little plastic canopy fashioned out of an Ikea Samla storage lid. Only here are predators who would normally finish this OAP off before nightfall kept at bay for as long as pigeon dotage lasts. And yet. And yet. As David Byrne sings with a pause-laden languor verging on leaden: “heaven…is a place…where nothing…nothing ever happens”. Whereas gardens, even those set up as a heavenly refuge cannot ever entirely keep nature, red in tooth and claw, at bay. Even when using the best, most electrified ingenuity that we possess. Today there was no Bertie, and not because he’d slipped away in his sleep under the sunny yellow Choisya bush, or because a week of sunflower seeds and suet balls had given him the power of flight once more. Instead, on the path to the summer house I found remnants of some late-night, predatory tussle, feather everywhere, but no body in sight. I wandered around in the mist and rain for a while somewhat forlornly bleating his name, expecting him at any moment to totter out from one of the flower beds as he has been doing for the last week or so, but Mr B was not to be found. RIP Bertie-boy. A fine pigeon who had some happy times in my garden, and a few extra days of electrified reprieve before his end finally came. Thinking of you, buddy.